Right now, only Australian users can bet on Skrilla. 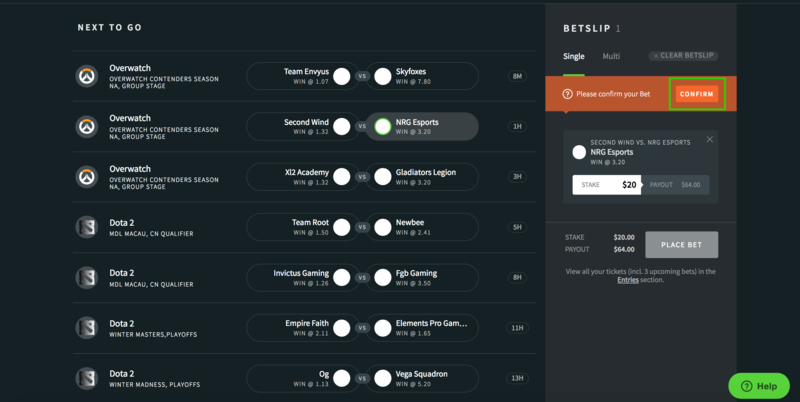 If you are outside Australia, you can play our daily fantasy esports contests. Click here to visit our fantasy page. In 2019 we plan to make betting available in additional countries. Before you can place a bet, you need to create an account. 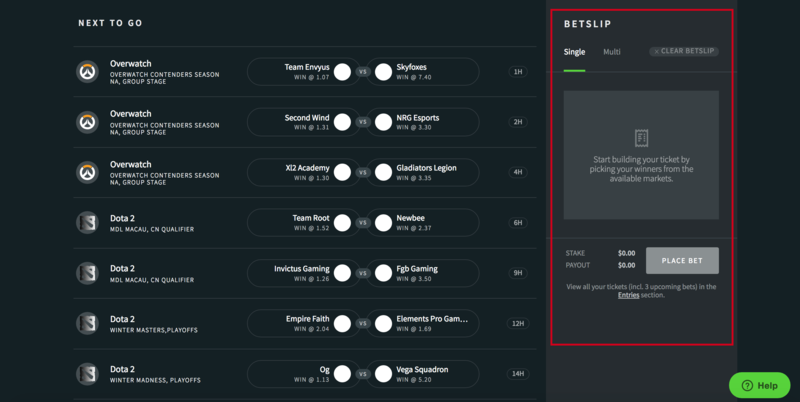 From the main betting page (https://skrilla.com/betting) start by entering your email in the top right corner, then select 'BEGIN'. Enter you Date of Birth. You must be 18+ to register. This is a gaming regulation requirement. Enter your full name. We need this as part of your identity verification, again this is for gaming regulation. Enter your display name. Also keep an eye for our promo codes (you can also enter promo codes after signing up). In this last step you can also set deposit limits if you like (this can also be done later on). Email verification. You will receive a verifiation email to verify your account. This can be done at a later point in time, if you wish. To deposit money you need to visit the ewallet deposit page. Click on the '$0.00' in the header bar, on the right hand side. This will produce a dropdown. Click on 'DEPOSIT'. Enter your card details. 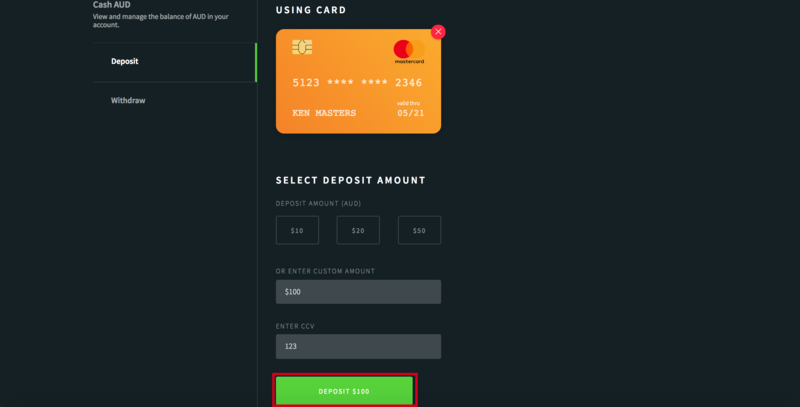 You can deposit $AUD with either a Mastercard or Visa credit / debit card. After your enter your card details, click the 'ADD CARD' button. 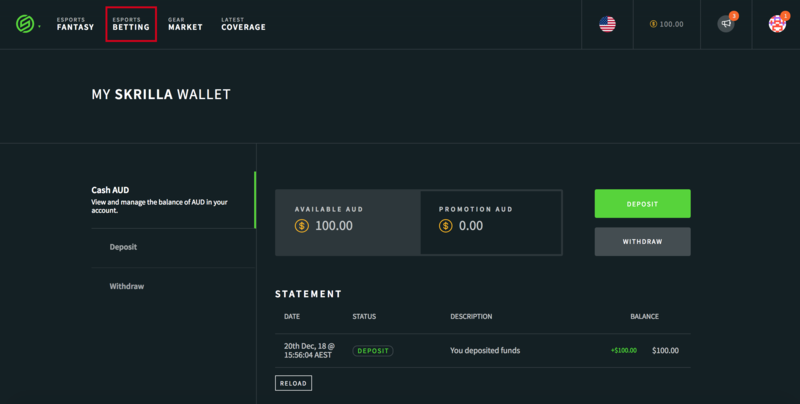 Once the card is added you can select a quick deposit amount of $10, $20 or $50 or enter in a custom amount, in the field below. Then enter your CCV and selected the 'DEPOSIT' button. After you have deposited money, next you need to navigate to the bet page. 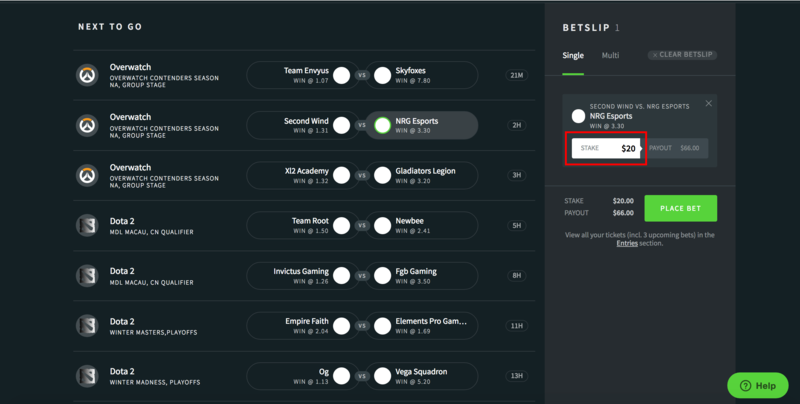 To do this, click on the 'Esports Betting' link in the header bar. 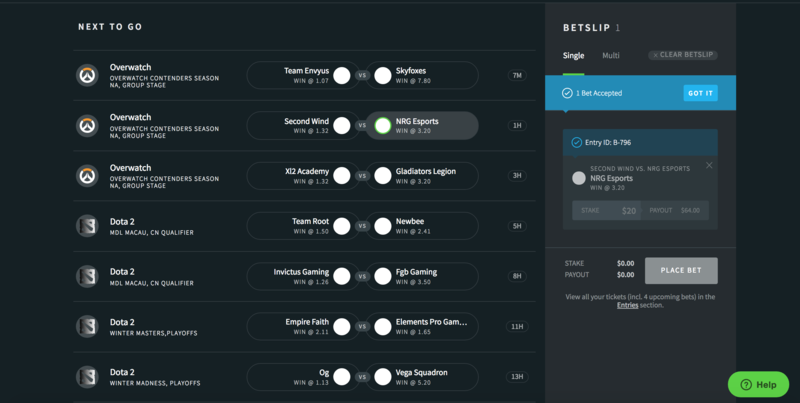 This will bring you to the list of esport matches you can bet on, shown in chronological order of time till start. On the right of screen you will see the betslip. If you are on a mobile device you can display the betslip by tapping the icon in the top right corner. You can think of the betslip a bit like an online shopping cart. When you click on a betting market you would like to bet on, it will be added to the bet slip. Similar to how you would add an item to purchase to a shopping cart. Select a market to bet on. This will add the market to your betslip. Enter the STAKE amount. In the STAKE field, enter the amount you want to bet. Place bet. After you have enter the stake amount, select the PLACE BET button and then confirm the bet. And that's it, you have placed your first bet!